The Speech Warm Up is BACK! SMARTBoard Style! Looking for a quick and easy way to target a bunch of goals? Try the Speech Warm Up! I've spoken about this before, but I love this! You can target new vocabulary, synonyms, antonyms, compare/contrast, and idioms! It's fantastic! I am lucky enough to have a SMARTBoard in my room, making the warm up interactive! In the beginning of the year, this usually takes a bit to teach the concepts associated with the warm up. HOWEVER, by the end of the year this is taking you 5 minutes - max. 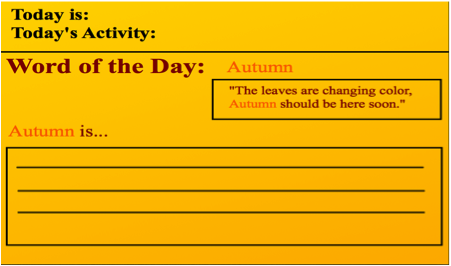 This is my "week 1" warm up, I'm focusing on fall vocabulary from the packet I brought you on Monday (found here.)! Download this warm up HERE and start, well, warming up!